Autism spectrum disorder (ASD) comprises a group of genetically heterogeneous neurodevelopmental disorders with an estimated prevalence of 1% in the childhood population. ASD is characterized by an impairment of social interaction and communication, accompanied by a pattern of repetitive and restrictive behavior, typically diagnosed in the first 3 years of life. The genetic causes of ASD are diverse but the main category of genes associated with the disorder is related to the development and function of neuronal circuits. Mutations of genes coding for synaptic cell adhesion molecules and scaffolding proteins, such as neuroligins (NLGN), neurexins (NRXN) and SHANK, have been reported in patients with ASD. These proteins play a crucial role in the formation and stabilization of synapses as well as in synaptic homeostasis. and moderately in brain and spleen. 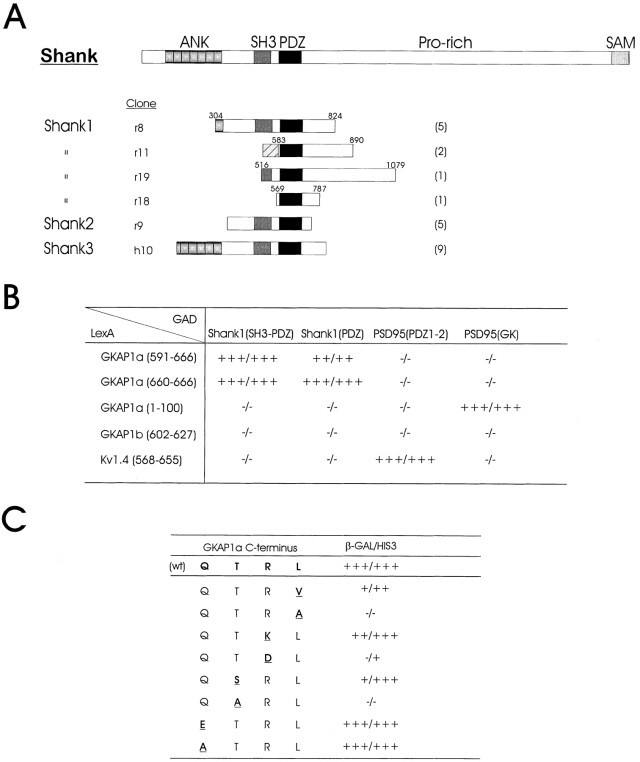 Shank family genes (SHANK1, SHANK2, and SHANK3) are causative genes for idiopathic autism spectrum disorders (ASD). Shank is a family of scaffold proteins that are currently known three members: Shank1, Shank2 and Shank3, also known by the name ProSap, ProSap1 and ProSap2. more than half of the protein, a short domain to α-helix (SAM), in addition to the C-terminal domains and N-terminal. All these domains serve as binding sites for the different proteins and is just based on this structure that the family and considered to belong to the protein "scaffold". Shank family is able to interact indirectly with the main receptors involved in the postsynaptic currents: the NMDA and AMPA receptors. ASD. Shank2 in particular, the protein strongly expressed in the brain, is the protein that is mutated or absent in patients with autism. However, it has been shown that mutations of Shank3 also can interfere with the correct functioning of the nerve cell and determining behavioral symptoms that fall into the category of ASD. The Shank family of proteins interacts with NMDA receptor and metabotropic glutamate receptor complexes in the postsynaptic density (PSD). The postsynaptic membrane of central excitatory synapses is characterized by an electron-dense thickening known as the postsynaptic density (PSD), which contains glutamate receptors and other membrane proteins anchored in a matrix of cytoskeletal and signaling molecules. At excitatory synapses in the brain, receptors for the neurotransmitter glutamate are clustered in the postsynaptic membrane, where they play crucial roles in synaptic transmission and synaptic plasticity. The excitatory neurotransmitter glutamate acts on two principal classes of postsynaptic receptors: ionotropic glutamate receptors and group I metabotropic glutamate receptors. Ionotropic glutamate receptors are glutamate-gated ion channels responsible for rapid synaptic transmission and ion flux across the postsynaptic membrane. Metabotropic glutamate receptors are G-protein-coupled receptors that influence neuronal excitability, synaptic transmission and synaptic plasticity through the activation of second messenger cascades. Both types of glutamate receptor are concentrated together at the postsynaptic membrane of excitatory synapses. The PDZ domain of Shank binds to the guanylate kinase-associated protein (GKAP) family of PSD-95 binding proteins, thereby linking Shank to the N-methyl-d-aspartate (NMDA) receptor/PSD-95 complex. In addition, the PDZ domain interacts with somatostatin receptors and the calcium-independent α-latrotoxin receptor. Two distinct proline-based motifs within the proline-rich region of Shank form the binding sites for cortactin, an actin regulatory protein, and for Homer, which also binds group 1 metabotropic glutamate receptors and inositol-1,4,5-trisphosphate (IP3) receptors. Through its interactions with GKAP and Homer, Shank has the potential to link together the NMDA receptor and metabotropic glutamate receptor complexes in the postsynaptic specialization. Shank is a signaling adapter excitatory neuronal synapses. 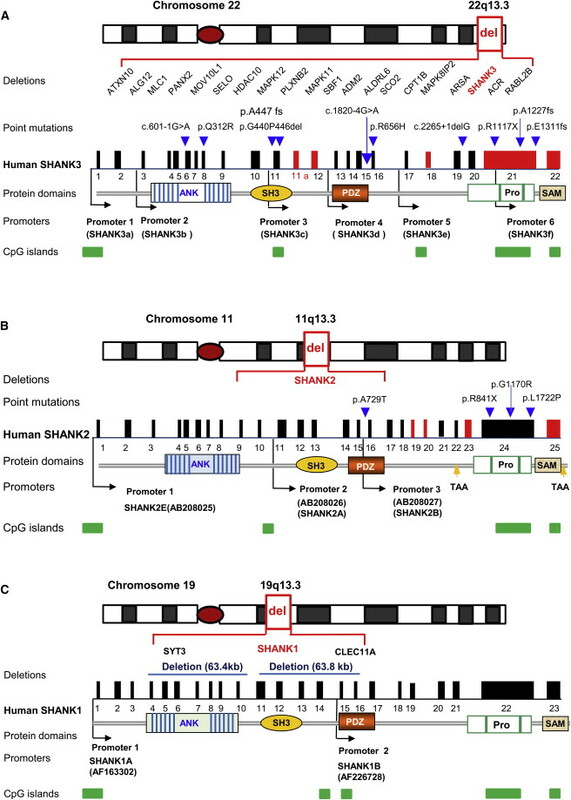 A single de novo microdeletion of Shank 2 found in the ASD, leads to the loss of exons 6 and 7 and a sliding of the reading frame, resulting in the removal of the PDZ domain and remaining domains in the protein Shank2. Shank2 mutant mice ( - / - ) , carriers of an identical mutation to the microdeletion in the human gene associated with ASD, exhibit an autistic behavior type including reduced social interactions , reduced social communication via ultrasonic vocalizations and repetitive jumps . The genetic deletion occurs in a specific region of the brain and causes the up-regulation of ionotropic glutamate receptors at the level of the synapse. Furthermore , mutants ProSap1/Shank22/2 show a reduced basal synaptic transmission a reduced frequency of excitatory currents postsynaptic and a greater amount of NMDA receptors that mediate excitatory currents in physiological level. The postsynaptic potentials decreased by 40% in mice ProSap1/Shank22/2. glutamate, blocked by magnesium ions in the lower potential of - 40mV ) . AMPA receptors is opened by a high concentrations of the neurotransmitter glutamate. that leads to depolarization of the membrane up to - 40mV . This potential membrane is necessary to remove the magnesium block of the NMDA receptors . The NMDA receptor free from the block, bind the glutamate and let the sodium pass, but especially , calcium , which allows the function of the receptor. In agreement with the up-regulation of subunit of the NMDA receptor in the hippocampus of mice ProSap1/Shank22/2 , there was registered a 30% increase of the ratio NMDA / AMPA in the mutant mice compared to wild-type. The deficiency of Shank2 leads to a disturbances of the signaling associated to NMDA receptors. found that D-cycloserine fully recovers the ratio NMDA / AMPA.